All official rodeos must contemplate a reining competition immediately prior to the Rodeo finals. To obtain the title of Champion in Reining, a rider must score a minimum of 25 points. The Champion in Reining should obtain a prize that is equivalent to the third place in the finals of the Rodeo competition. The “Complete” Reining Competition is required in all fair expositions, special official rodeos, national championship rodeos, classifying rodeos and scheduled official rodeos. Art. No 1- The appearance of the rider, his horse and his tack should coincide with the ideas that are expressed in Article 11 regarding what is considered a well-mounted huaso. Art. No. 2- The contestants must execute all the phases of the competition, barring disqualification. The order of appearance will be configured by an official worksheet and will not be altered for any reason. Art. No. 3- Once each phase of the competition is completed, the judges must relay the score obtained by each competitor. This is an undeletable obligation that cannot be changed by any jury, even as a matter of exception. If for any reason this is not implemented, the competition will lose its official status. As a result, any phase executed with perfect technique and performed at a fast speed, would obtain the maximum score possible of 10 points. Art. No. 6- Horses using a cavesson, noseband, martingale, tie down, tongue tie or other untraditional aids in regard to the Chilean Horse tack will not be permitted to compete. Art. No. 7- Horses six years old and younger can be shown in leather bit (guatana), or snaffle bit, but older horses have to be shown in solid bits (Chilean bit is traditionally a beaded O-ring bit with a medium port and practically no shank). Art. No. 8- The various phases of the reining competition should be performed in a continuous manner, without delays of any nature. As a result, the rider cannot take time to introduce his horse to the arena in any of the phases of competition. Art. No. 9- “Older horses” are understood to be horses that are seven years old or more. Art. No. 10- Organizers must seek authorization of the Chilean Rodeo Federation to carry out the reining competition. For the Rider: good seat and positioning, correct use of the legs, reins and body weight in cueing the horse. For the Horse: The principal characteristics Chilean Horses should be taught in Chilean Horse training methods are: to be energetic, to be dependable, to be flexible, to possess speed, to be agile in movements, to have a good mouth and to maintain a proper hind leg posture. This phase implies showing the walk, trot and canter gaits of the horse. Key elements for scoring: The walk should be solid, sustained and fast without inadvertently changing to a trot before being asked. The trot is extended and the rider should post. The canter should be a transition from the trot and it should be picked up on the inside and implemented in a relaxed but collected manner. The stop should be performed in front of the judges, while noticeably tucking in the hind legs. The horse should finish by standing squarely on all four legs. This phase implies running a horse in a straight line to an abrupt stop with the haunches well under the horse. Once the horse is tranquil, it is turned over its haunches 180 degrees to the side that faces the judges. The horse is then asked to cross the arena at a run in the opposite direction, coming to an abrupt stop near the opposite wall. Once the horse is tranquil, it should be turned 180 degrees over the opposite hind leg, again on the side that faces the judges. The horse should then pick up another run and proceed halfway across the arena where the horse is brought to an abrupt stop in front of the judges. The exercise should end with a quarter turn that places the horse facing the judges. Each time the horse runs by the judges, the rider is asked to spur his horse at least once with both legs. Key elements for scoring: A moderate slide with the hind legs is desirable. Deeper penetration with the hind legs is appreciated more, even if the forequarters are elevated higher in the process. The judges look for a relaxed horse after the stop. Inner hind leg should be the pivoting leg for the half turns, and the horse should not take a step backwards in implementing these turns. All the runs across the arena should cover the same tracks. The horse should show a good mouth when reins are pulled to ask for the stop. Reactions such as opening the mouth or elevating the muzzle too high should be penalized. 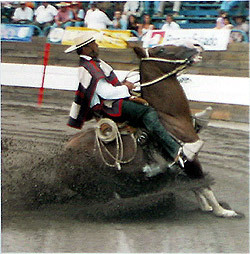 Spurring in front of the judges is critical to show the horse is tolerant of the spurs. Correct head posture is emphasized, but a higher carriage than normal is tolerated. Author’s comment: As is also the case in the mother country of Spain, in Chile the stops were meant to show that horses could stop “on a dime”, or over a handkerchief that was placed on the ground. As a result, long slides did not meet these objectives, whereas a powerful stop with the legs well under the body did. A six-meter (approx. 20 feet) circle should be implemented at a high speed, making at least two laps in each direction. An abrupt stop should end the circles in the first direction, and a half turn over the haunches should be made to the outside of the circle before resuming the circles in the opposite direction. These circles should be terminated with a sudden stop in front of the judges, followed by a quarter turn to the outside of the circle, leaving the horse facing the judges. The tracks of the first circle should be traced in subsequent circles in either direction. Key elements for scoring: In implementing the exercise it is acceptable that the horse angles his head slightly towards the outside of the circle, in order that a perfect and clear hind leg posture can be attained. Attention is placed on how well the horse retraces the tracks of his first circle. Signs of agility and speed count a great deal in this exercise. The figure eight is performed in an area that has a total diameter of no more than 10 meters (approximately 33 feet). A minimum of two laps is required on each side of the figure eight. Riders will be penalized for not following the first tracks of the figure eight. The flying change of leads should occur in the center of the figure eight.Key elements for scoring: Following the original tracks is crucial. The forelegs and hind legs should change leads simultaneously with no cross firing in any stride. Rider aids of shifting body weight and leg positions should coincide with the horse’s change of leads. Good hind leg posture denoting that inner hind leg is main support leg is valued. The horse is started on a fast run straight across the arena, and it is asked to slide on his haunches and, without stopping, make a rollback over the hind leg on the side of the judges and take off at a run in the opposite direction. On the other end of the arena, the horse is asked to slide on its haunches once again and, without stopping, roll back over the opposite hind leg, again towards the side of the judges. Continuing the run, the horse should now come to an abrupt stop in front of the judges and then perform a quarter turn so that it finishes facing the judges. Key elements for scoring: Judges will look for the correct posture that puts the weight on the internal hind leg as the pivot foot. The horse should not come to a complete stop or back up when making the roll back. Begin by standing still, facing the judge. Then begin two to three spins in one direction and immediately go into two to three spins in the opposite direction. Key elements for scoring: Correct positioning of the pivot leg. Ideally, the horse should stand in one place. Backing is penalized more than moving forward. The rider’s leg placement is critical. A correct and natural head placement of the horse is desirable. Penalties will be given for horses that dip or bury their heads while spinning. Both the dismount and the mount should be performed naturally, with no exaggerations. After dismounting, the rider should back off a ways from the horse, before approaching and mounting once again. When mounting, the horse should not move its legs or dip its back. Key elements for scoring: Judges look for a horse that stands squarely and perfectly still.They want to see a solid loin. Judges look for natural movements of the rider. The stirrup should be placed so that it doesn’t pressure the horse’s elbow or ribs. Ideally, it should be placed parallel to the horse, using the leverage of the knee to mount and dismount. The left hand should have the reins and the tuft of mane (gatillo), and the right hand should be braced on the saddle near the stirrup leather of the opposite side. The backing should be done in a straight line and in a uniform movement. The horse should not open its mouth while backing. The horse should back naturally and with a continuity of movement.Key elements for scoring: Natural and continual movement of the legs, which should displace themselves in diagonals symmetry (opposite hind and foreleg moving together). The horse should not deviate from the imaginary straight line trajectory while backing. Final Comment: In Chilean Rienda there are no patterns run. Each maneuver is done independently and a score is determined by the judges immediately upon its completion. At then end of all maneuvers a total score is given and recently this has included a conformation score that is assigned each of the participants before the competition begins.